Without our volunteers Blythe House could not function. Our team of over 250 volunteers collectively donate approximately 590 hours of their time to us each week. We constantly face the challenge of finding the money to cover our running costs. That’s why we’re delighted and very fortunate, to have a team of over 250 volunteers supporting the hospice on a regular basis. They play an integral and vital role at Blythe House and their support means that we can spend the maximum amount of money directly on support and care for our clients. We have a wide range of volunteer roles based at the hospice, and in our four shops located in Buxton, Chapel-en-le-Frith, New Mills and Whaley Bridge. Some of our volunteers are actively involved in more than one role. Our volunteers undertake many different and important roles for us, and they bring a wide range of skills and experience to those roles. Whether it’s helping in one of our shops, collecting donations, driving, covering reception, helping patients in our community, providing therapies, or one of the many other roles, volunteers are an essential part of the Blythe House team. Find out more about our volunteer roles. We welcome people who want to be involved in an organisation that promotes a positive approach to living with cancer or other life-limiting illness and where clients are determined to get the most out of life. We expect our volunteers to be reliable, empathetic, understanding of the need for strict confidentiality and able to bring life skills and experience to their volunteer role. What do volunteers get out of it? Our volunteers aren’t paid but their rewards include knowing that their support is appreciated by clients and staff, and that they are part of a team that makes a real difference to people in our community living with a life-limiting illness or bereavement. In addition, we offer free, ongoing, high quality training relevant to their volunteer role and the opportunity to learn new skills. We are very proud of our volunteers. They are important ambassadors for Blythe House in the community and we very much appreciate the time and commitment they give, and the skills and experience they bring to their roles. 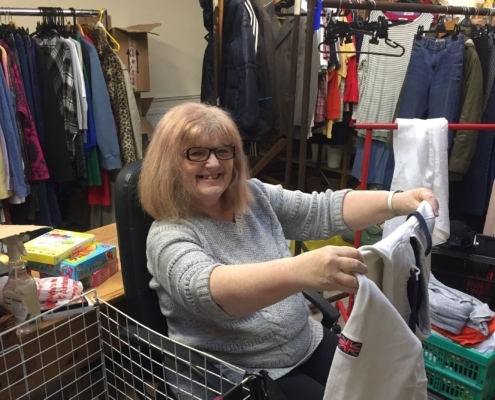 To become a volunteer in a Blythe House shop you need to be over 16 years old. To become a volunteer at Blythe House Hospice you need to be over 18 years old and able to give a regular, long-term commitment. We expect our volunteers to be willing to undertake any training required for their role. Volunteer counsellors and complementary therapists must have recognised qualifications and the relevant experience, knowledge and skills required for their roles. Proof of professional qualifications is required. These roles also demand a firm time commitment. Police checks are undertaken for all hospice-based volunteer roles and all volunteers are required to provide two satisfactory references. Given the sometimes difficult demands of volunteering both within, or connected to, a hospice environment, we strongly recommend that clients and former clients only consider volunteering after 12 months has passed since being discharged from our clinical or counselling services. Please refer to our policy on client support for Blythe House for more details. However, there are other ways of supporting Blythe House, please contact us for details.